K-12 library leader Shannon McClintock Miller is the new spokesperson for Future Ready Schools ®Librarians and Project Connect. Miller previously served as the district teacher librarian at Van Meter Community School District in Iowa for eight years, and currently is an international speaker and author of an award-winning blog. 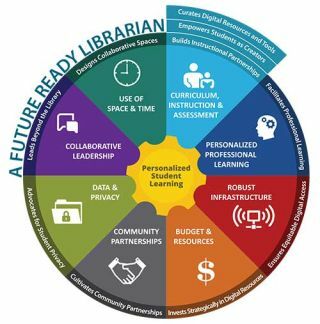 Last summer, Future Ready Schools (FRS) – led by the Alliance for Excellent Education – formed Future Ready Librarians (FRL), an expansion of the FRS initiative aimed at positioning librarians as leaders in the digital transformation of learning. Project Connect was formed by Follett to advocate for librarians to serve as leaders in their district and schools. In February, Miller and Mark Ray will be introducing the “Future Ready Librarians Webinar Series,” a bimonthly program designed to introduce the FRL initiative and how information and technology professionals can support FRS. The first webinar – “Future Ready Librarians: What’s Not to Love?” – is scheduled from 4 to 5 p.m. EST on Tuesday, Feb. 14. To register, visit all4ed.org/webinar-event/feb-14-2017.